United States Senator Lindsey Graham (D-South Carolina) has announced his intent to introduce a federal-level online-gambling prohibition bill as soon as next week, with the express purpose of overriding the famous late-2011 opinion by US Attorney General Eric Holder that the United States 1961 Wire Act applies to only to sportsbetting. Graham’s planned introduction of his online-gambling ban arrives, as expected, not long after his pre-planned political alignment with Las Vegas Sands Corporation CEO Sheldon Adelson. Last year, billionaire Adelson announced his plans to spend “whatever it takes” to stomp out all forms of online gambling, and thus buttress the long-term fortunes of his personal land-based casino empire. Lindsey Graham does his benefactor’s bidding by agreeing to introduce a federal bill seeking to ban online gambling. Adelson’s LVSands empire derives the majority of its profits from a series of mega-casinos in Macau, though it also operates the upscale Venetian and Palazzo properties on the Las Vegas Strip, along with the smaller Sands Bethelem casino in eastern Pennsylvania. Also in 2013, as recapped by Politico.com today, Graham aligned himself with Adelson’s profiteering intents by agreeing to attend a lavish fundraiser at Adelson’s luxurious Venetian resort. 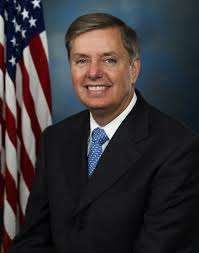 Hundreds of thousands are believed to have been donated to Graham via the event, held at the private Paiza Club on the Palazzo’s 50th floor, with the cheapest dinner seats priced at $1,000. Better seats with elbow-rubbing privileges cost $5,200, though there weren’t any discounts of the Chinese cuisine and Johnny Walker scotch. Adelson and his wife, Miriam, also made additional individual donations o Graham. Graham’s announced intent, following a course of action pre-plotted by Adelson and his newly-created Stop Internet Gambling group, is to revitalize what anti-gambling proponents believe to be the Wire Act’s original intent, a blanket ban on all forms of gambling using and available means of electric or electronic communication. The Wire Act had been used as the platform on which other federal gambling laws were based, such as the 1978 Interstate Horseracing Act (a carveout for pari-mutuel interest) and the onerous 2006 Unlawful Internet Gambling Enforcement Act (UIGEA), an overbroad, poorly-drafted series of banking restrictions designed to stop the flow of money to and from Internet gambling sites from the US banking system. Combined with US authorities’ traditional over-application of the Wire Act’s prohibitions, which had begun suffering court setbacks, the UIGEA’s poor structure created considerable unintended or unrealized consequences, with state lotteries being unable to sell tickets online or electronically and other skill games, such as fantasy sports, severely hampered by irrelevant Wire Law / UIGEA considerations. The most strident anti-gambling faction of the American public, now being united by Adelson’s tens of millions in spending, seeks to restore those Cold War-era blanket bans, which were initially designed to stop out thriving bookie activity and little else. The skeleton of the proposed bill has been circulated by Graham’s office in recent weeks. It is a very brief draft measure (available i its entirety below), and was traced directly to a GOP lobbyist now working directly for Adelson’s Venetian Casino Resort entity, a division of Las Vegas Sands Corporation. As noted in reports at TheHill.com and elsewhere, the draft measure was actually authored by Darryl Nirenberg, a lobbyist working for leading DC firm Patton Boggs LLP. Nirenberg, who lobbies almost exclusively on the GOP side of the aisle, is shown as the lobbyist working for the Venetian Casino Resort on this InfluenceExplorer.com tracking summary, while this page at OpenSecrets.org shows that Nirenberg’s firm, Patton Boggs, received $210,000 from Adelson’s Venetian in 2013 alone. Nirenberg and a lobbying assistant left their names in the tracking infomation on the draft skeleton (a Word document), which was then circulated by Graham’s office, unchanged, as part of the direct payback for Adelson’s donations and fundraising. As can be seen from the language below, the bill would specifically expand the Wire Act to include Internet references, and invokes the largely imaginary specters of money laundering and cyber-terrorism to arouse patriotic fear and drun up anti-gambling support. The continued claims of online money laundering by Adelson and his paid backers remain the most delicious irony of the bill, given that the $47 million Adelson’s Las Vegas Corporation paid in fines to resolve major money laundering being done through Adelson’s Venetian assuredly dwarfs by magnitudes the largest money laundering ever conceived or attempted through online-gambling channels, which are uniquely unsuited for the purpose. To restore long-standing United States policy that the Wire Act prohibits Internet gambling to give Congress and the public time to fully examine the issues surrounding Internet gambling, including the potential for money laundering, fraud, terrorism financing, cyber-crimes and participation by minors; and for other purposes. To restore long-standing United States policy that the Wire Act prohibits Internet gambling to give Congress and the public time to fully examine the issues surrounding Internet gambling, including the potential for money laundering, fraud, terrorism financing, cyber-crimes and participation by minors, and for other purposes. SECTION 1. SHORT TITLE. This Act shall be cited as the “Internet Gambling Control Act”. (6) The availability of technology which can be used to prevent participation by minors in Internet gambling and determine the location of an individual placing a bet on an Internet gambling site; and whether such technology can be defeated or circumvented through the use of technology, fraud or other means. (7) Whether the Federal government has the ability in terms of qualified personnel and financial resources to effectively police and prevent use of Internet gambling sites for criminal activity, including money laundering, cyber-crimes, terrorist financing, and fraud, and to prevent participation in Internet gambling by minors and by individuals located in states in which Internet gambling is illegal. SEC. 3. WIRE ACT CLARIFICATION. (1) the term “wire communication” includes the Internet, and any activity which involves the use, at least in part, of the Internet. (2) the term “any sporting event or contest” includes games in part or predominantly subject to chance, including games in which players compete against each other, and not against any person, entity, or fellow player hosting the game, the outcome of which, over any significant interval, is predominantly determined by the skill of the players,and the purchase of a chance or opportunity to win a lottery or other prize (which opportunity to win is predominantly subject to chance). (3) use of a “wire communication facility for the transmission in interstate or foreign commerce of bets or wagers” includes any transmission over the Internet carried interstate, incidentally or otherwise. (4) the term “bets or wagers” does not include any activities set forth in 31 USC § 5362 (1)(E), or any activities permitted under 15 U.S.C. 3001 et seq.